It’s no secret that camping is excellent for your wellbeing. Sometimes, there’s no greater tonic to the stresses of modern life than hitting the countryside, either for some solo time or to hang with family or friends. To do so enjoyably, you deserve the best tent for your budget and for the way you want to camp. The latter is especially important. Why? You might enjoy the ease of car camping, and can therefore take a bigger tent designed with extra special features to added luxury. Or you might love hitting the trail alone, pitching up wherever you can find a quiet spot. A lightweight fast-pitch backpacking tent would suit you best there. Walk into any camping gear shop and you’ll quickly see the sheer volume of tents available. So much choice could make it harder for you to find the best tent for you, so we've covered off all of things you need to consider – from the hardiness of your tent to how quickly you want to be able to pitch it – to help you find The One. To make things even easier we've then expertly curated a selection of the 11 best tents you can buy right now. You're welcome! When you’re heading away for a couple of days camping, you don’t need a big, fancy tent that takes an army to pitch. The best tent for this scenario has a simple, easy to wrangle design, yet offers enough room for comfortable living and sleeping. For those reasons, our current top choice is the Vango F10 Xenon UL 2, which is a brilliant all-rounder of a tent. Light, robust, and with a host of quality details, this is a tent that’ll do anything, from alpine camping trips to a weekend in the Lakes, and from car camping to hiking. This really is a one-stop solution to outdoor sleeping. It’s tempting to go for the cheapest option when choosing a tent, but, in our many years of testing, this is often a false economy – that tent you paid £40 for will probably end up in landfill before next summer. Investing in a high-quality tent that will last you years means you won’t have to go through the rigmarole of researching and buying a new one each spring. It’s also good news for the environment, so you’re doing your part for the planet’s wellbeing in addition to boosting your own by getting outdoors more. Our ancestors might have been down with dwelling in caves, and yes cave camping is still a thing, but most people do it with a little more comfort and luxury these days. Tents are essentially our temporary home outdoors; a (sometimes very swish) shelter to retreat to for more comfortable living and sleeping when camping. Depending on where you’re camping and the climate, your tent can keep you safe from intense sunlight and heat, from rain, extreme cold and wind, or from falling debris and insects. Oh, and not to mention keeping you at arms length from any local wildlife who might fancy a meet and greet while you’re sound asleep. What are the different types of tents? 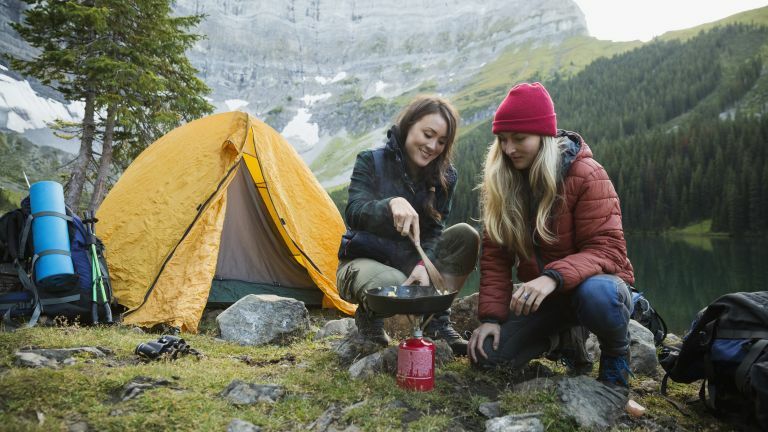 Some of the major brands you’ll come across in your journey to find the best tent for you include Big Agnes, Vango, Coleman, MSR, Terra Nova, Outwell, Decathlon, Hilleberg and The North Face. There are lots of newcomers entering the (muddy) field too, with innovative designs coming from brands such as Tentstile, with its sublime floating tree tents, and Cinch, with its nifty pop up modular tent. Why do you want to buy a tent? Where are you going to use it? Are you camping alone or will you be camping with others? How many others? And do you want to camp in the spring or summer only, or are you looking for a three season+ tent to help you enjoy the outdoors well into the colder months? These are all great questions to keep in mind when reading through our picks for the best tent below. During our research and testing, we considered tents of all shapes and sizes, but each of them has one thing in common: they’re designed to keep you and your gear warm and dry, no matter what the elements throw at you. Ready to dive in? Then here’s our expert picks, with each individual tent carefully chosen because it’s the best option for a specific scenario, use or budget. The F10 Xenon falls into Vango’s alpine range, designed to be robust yet as light as possible, and with a star-studded spec-list to boot, it’s well worth a look for anyone planning to carry their home on their back for a while. A mere 800 grams per person, this three-four season tunnel tent provides plenty of space too, with a decent porch area that’s big enough for rucksacks, boots and even for cooking at a push. 'Pitch as one' means this tent will pop up in a trice, and that attention to detail extends throughout - ‘o’-shaped doors for one-handed opening, dyneema-reinforced peg points and an oversized opening in the packing bag to enable faster packing, Yunan SD70 Poles, mini line-lok guyline runners - the list goes on. Although it’s not a cheap tent (around the mid-£300 mark) the Vango F10 Xenon offers high-end features and low weight that you’ll only see on the best tents, making it very good value for money, and a buy that will continue to be great value for many years. Indeed, the tunnel design could be potentially compared with the Hilleberg Nallo, a tent costing easily double the price. Light enough to carry on treks, strong enough for UK conditions, and roomy enough for a genuine two-person sleeper, the F10 Xenon is a bit of a gem. The Terra Nova Laser compact is a big fat cheat. It’s not new, or clever. However, it is one of the world’s most popular and proven ultralight tents in a new, shorter format for 2019. So short in fact, that it fits easily in bike panniers. The result is a tent that’s been tested across the globe in every set of conditions you can imagine, but more portable and improved in a few other subtle ways. It’s light, of course, at a shade over a kilo. Plus, it's packable and super-quick to pitch due to the inner and outer being connected to ‘pitch as one’ - very helpful if you find yourself striking camp in the pouring rain. The main pole is a high quality DAC NFL alloy, which won’t split or break under normal conditions, and you’ll have a hard time breaking the Dyneema guylines. As ever with the Lazer, ‘two man’ is a bit of an exaggeration, sizing up pretty snug for two, but when traveling fast and light you’ll not worry about that too much. It’s also important to note that even though this is rated as a three-season tent, that’s three UK seasons, which means it’ll hold up in pretty brutal conditions. In short, if you’re looking for a lightweight 1-2 man tent with the shortest packsize and designed to withstand all UK weathers, this is the one. You won’t have any issues with mistaking your tent for someone else’s when it’s this bright. The MSR Access 2 is a firm favourite among backcountry skiers and splitboarders, as it’s light to carry, easy to pitch, and provides warmth and protection from the cold. Lighter than a mountaineering tent but warmer than one built for backpacking only, MSR has designed the Access 2 with an innovative pole structure that stands proud against the wind, actively ‘shedding’ it to stay upright. It’s strong enough to withstand overnight snow-loading too, so even if there’s a fresh downfall while you sleep, it won’t cause you any trouble come morning. Without question, this is the best tent for serious powder hunters. Fancy taking your squad into the great outdoors? Make your trip special with one of Vango’s most luxurious inflatable tents, ideal for families and friends to camp comfortably together. There’s so much space inside the 500 XL AirBeam, you could throw an in-tent party and still have room to set up your camping table, laden with treats and drinks, as well as a few padded camping chairs for added luxe. The best tent for longer camping holidays where space and comfort are a must, Vango's five man 500 XL Air offers king-sized bedrooms, a big living space and a pre-attached awning that can be opened up as an additional seating area. There are many other features making the 500 XL Air worth checking out, and we’ve enjoyed lots of them while testing this tent. These include Super AirBeams, Vango's clever inflatable 'poles' that helped us erect the tent without breaking a sweat. The tent also benefits from a SkyTrack II hanging system, giving you the means to hang camping lanterns, wash bags and more, freeing up much-needed floor space. View the Vango TC 500 XL Air. The Blackout 3 festival tent is a lot of tent for the money, retailing at under £100, but delivering plenty of space and innovation for not very much cash. Sure, the spec isn’t as stellar as some of the more expensive mountain tents here, with cheaper fibreglass poles and heavy weight to match, but for festival space and car camping, this is well worth a look. The 3-person geodesic-style space is a decent mid-point between being constrained in a smaller space, and the enormousness of full-fledged family tents. Seasoned festival goers will understand the pain of being woken up by the blazing morning sun. This tent includes Coleman’s ingenious ‘blackout’ fabric tech. This cuts light (up to 99% according to Coleman) so you can void the startling 5am summer wakeup. The blackout fabric also traps heat in the day, resulting in a cooler daytime interior (5 degrees) and slightly warmer at night. A swift ten minute pitch time and a roomy porch top off a robust offering - just don’t plan on carrying it very far. The Snugpak Journey Solo joins a long heritage of solo bivvies from Snugpak. Although it is a single person tent, the hoops transform it from a real bivvy (which is basically a waterproof bag), into the realms of actual camping. This means that reading a book or checking a map from the comfort of your sleeping bag is a practical option, which is very useful in unpredictable UK weather. Essentially a mini tunnel tent, the Journey Solo has two aluminium hoops, a complete mesh inner-first pitch (so you can pitch mesh-only in the summer if you’re feeling brave), and is possibly the most wind-resistant tent available today. A set of broad vents will keep condensation to the bare minimum, while a robust groundsheet and included protective footprint will prevent any nasty spiky surprises on the ground from ruining your snooze. At 2kg there is a penalty to pay for this full-feature list, so it is worth looking at light 2-3 man tents if you need flexibility. For the lone ranger though, this is a veritable tent-palace. A classic mountain tent for two, the Quasar has been proven over decades of heavy use to be the ultimate shelter for all weathers and all climates. It was updated last year with 30 denier nylon ripstop Watershop fabric for the flysheet, reducing the weight of the tent even further. The same basic design has a variety of spin-offs for different extremes, from an ultralight version through to a full-fat polar expedition number with snow valances. We’ve used the waterproof and UV resistant Terra Nova Quasar in all sorts on conditions when hiking, and we’ve noticed it’s a lot quieter inside, even during high winds, than other tunnel-style tents. If you’re looking for bombproof and long lasting, this won’t let you down anytime soon. Pitching is easy too, as the tent comes with colour coded poles that makes it pretty much idiot-proof. Big Agnes has made a bit of a name for itself in the world of ultralight tents, and the newest contender from across the pond takes that to new levels. The Tiger Wall 2 Platinum weighs in at a frankly bemusing 878g trail weight. In context, that’s about the same as a single mountain boot - so light you could carry a spare one and use it as an ensuite gear store. However, the Tiger Wall 2 Platinum already has a kind-of-ensuite, with two porches provided for all your stuff, as well as a host of other quality attributes. DAC poles, lots of pockets (even phone-size ‘media pockets’ by your head for night-time podcast listening), gear loft loops, colour coded webbing and buckles and storm flaps all add up to a pretty incredible package for the weight. Of course, light does come at a price, so if you’re expecting a burly hessian beast that’ll cope with crampon accidents, you’re in the wrong place. Also the mesh inner is more suited to spring-summer UK use than at the colder end of the seasons. That said, it’s a lot of tent, and when weight is a concern the Tiger Wall 2 Platinum is the ultimate solution. Looking for a yurt to erect in your garden, or to take with you on an extended camping holiday? Sporting a super-heavyweight 18kg cotton construction, the Alfheim is ideal for car camping trips and semi-permanent dwelling, sleeping 8-10 people with ease. Named after the home of the light elves in Norse legend (obviously), the Alfheim 19.6 provides enough room for a stove or a campfire in the centre, with the top of the tent opening like a chimney for just this purpose. Don't worry about draughts as a result: there are a series of internal 'cabins' available to sleep up to four people, as well as a zipped-in floor for further protection and heat retention. When you've got a family to think about, your camping needs are pretty simple: you want as much space as possible. Outwell makes tents exclusively for families, and its range is vast – there are over 40 to choose from on the website, ranging from simple to out-of-this-world. The Montana hits the middle sweet spot, with space for up to six people and loads of room to relax inside. It also has a range of customisation options, such as a porch extension and a beefed-up roof for when the weather turns extreme. There are two separate and generously sized bedrooms, so you can introduce some private space as needed. If the weather’s nice, unzip the side porch and extend your living space directly into the field you’re camped on. Want a tent for less than £20? You got it. The thought of spending tons of cash on camping gear can be a little off-putting for beginners, especially if you don't need a load of space or you want a basic tent that's easy to wrangle. Decathlon's Quechua range offers solid options in just about every size and type of tent, starting with the perfectly fine two-man Arpenaz 2. It's easy to erect and pack down, and offers UV protection as well as shelter from drizzle and wind. You'll be able to pitch it by yourself without any drama, and when you're done the tent rolls down into a carry sack, so just sling it over your shoulder and go. As we said earlier, when buying the best tent for your outdoor needs, it pays to spend as much as you can afford. A good quality tent will last longer, have a wider range of features, and offer you better protection outdoors. For a great combination of practicality and durability but without weighing so much that you need a trailer, the Vango F10 Xenon UL 2 is a brilliant tent. If you’re looking for a more party-sized yet versatile model, the Coleman Blackout 3 festival tent offers plenty of space at a keen price point indeed. Mark Mayne is an outdoors journalist who specialises in camping, hiking and diving. Claire Davies is Senior Content Editor at T3 and routinely tests camping gear, and walking and hiking tech for the Outdoors channel.